The "common man" version of a leveraged Risk Parity portolio (40% stocks and 60% long term bond, Quarterly Rebalanced) can now be easily implemented using the 3X leveraged ETF's (UPRO=stocks, TMF=bonds). QUESTION: How can we properly test and asses the likelihood of future long term success of this portfolio? The purpose of risk parity is to improve portfolio efficiency via achieving better diversification. 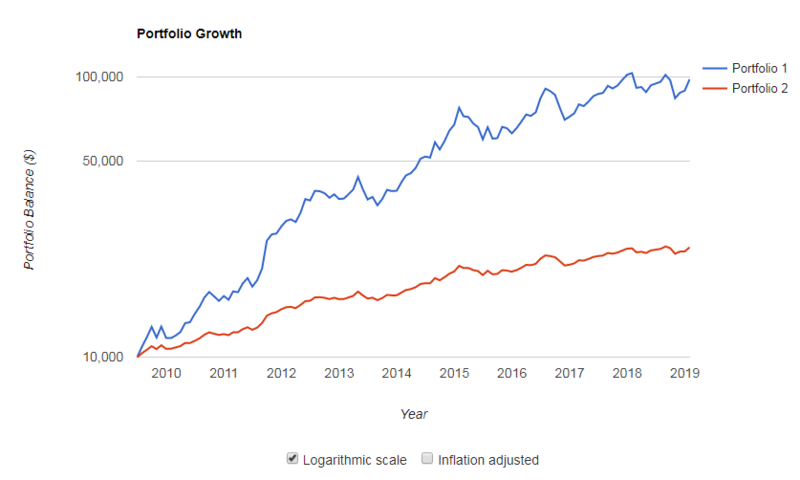 (We won't delve into philosophical debates about whether or not this is true here...) Mechanically, by leveraging up low risk assets (e.g., US Treasuries) and combining them with higher risk assets, you are spreading out the risks, so that the total portfolio risk isn't dominated by equities anymore. 40% SPY + 60% TLT is a simple risk parity portfolio (although far too simplistic to withstand many shocks; more on this later). Using UPRO and TMF just levers up a risk parity portfolio to boost returns, with associated increase in risks. It's perfectly ok if that's your objective and if you can tolerate the higher risks, but recognize that you haven't improved portfolio efficiency beyond the SPY/TLT combo at all. In fact, your backtest shows Sharpe ratio declined; i.e., for the same unit of risk, you're getting less return. Generally speaking, we should avoid directly comparing two portfolios with very different risk profiles. The backtest sample is quite biased. It covers just one economic regime – an extended economic recovery. It does not show how the portfolio will perform in adverse environments. The bulk of the sample happens to be a period of zero interest rate & strong monetary stimulations, which boosted stock and bond returns alike. In fact, you can see that the performance has been more subdued over the past few years as the Fed began tightening and there were multiple large drawdowns during a period when a simple 60/40 portfolio did fine. Here is my take on trying to answer this question. My backtest goes as far as December 1979 (just before the great bond bull run). I used daily total return index for Wilshire 5000 and 10-year constant maturity treasury rates. Remember you can proxy total bond return for $Yield - Duration*\Delta Rate$. Nevertheless, I agree with Helin that this is a less-than-optimal risk parity strategy. Ideally, we would need to include leveraged long-term inflation bonds, commodities, credit spread and breakeven inflation. To the best of my knowledge these asset classes are not available in geared ETFs. A simple unlevered risk parity holds 39% world equities, 14% 20y duration world government bonds, 25% 20y duration world inflation linked bonds, 14% commmodities, and 7% gold. See Bridgewater ppt on page 331. I still haven't figured out how to leverage this simple strategy using tools available to the small investor. Not the answer you're looking for? Browse other questions tagged etf asset-allocation leverage risk-parity or ask your own question.